Elias Pettersson had a dazzling five-point performance against the Colorado Avalanche on Nov. 2. After that game, the accolades were pouring in for the electrifying Vancouver Canucks’ star, with comparisons being made to Pavel Bure and other Hall of Fame players. It seemed like a foregone conclusion that Pettersson would win the Calder Trophy as the league’s top rookie in a runaway landslide. It’s more than fair to say that Pettersson had lapped the field in comparison to his rookie counterparts. But Pettersson has cooled off significantly in the 12 games since that breakout contest against the Avalanche, collecting just six points. 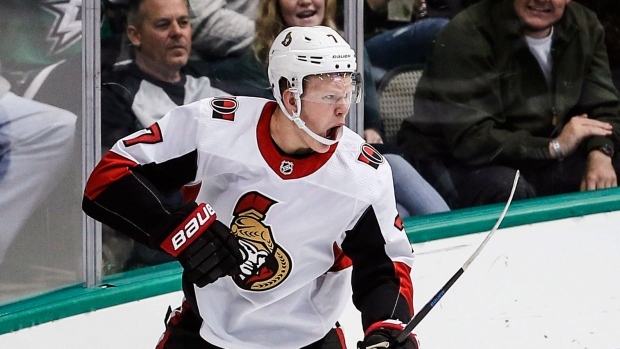 That has opened the door for Brady Tkachuk to quietly catch up to Pettersson on the scoresheet – and possibly pull even with him in the Calder Trophy conversation. On Tuesday night, Tkachuk was the main catalyst in the Senators’ improbable comeback win over the Philadelphia Flyers. Trailing 3-1 with less than 10 minutes to play, Tkachuk scored twice in the span of 1:54 to tie the game. As it stands now, Tkachuk has 16 points in 14 games and ranks second behind Pettersson’s 21 points in the rookie scoring race. But Tkachuk missed 11 games due to injury so far this season and it’s impacted his overall point total. Canucks fans will quickly point out that Pettersson also missed six games with an injury this season and that should be factored into the equation as well. But Tkachuk currently has a better points-per-game average than Pettersson (1.14 versus 1.00) and if he can stay healthy for the remainder of the season, it should make for a very compelling race in the final three quarters of the campaign. It’s probably overly optimistic to expect either player to continue this torrid pace, but the overall point should not be lost: Tkachuk is having just as an impressive start to the season as Pettersson. Tkachuk’s success is even more extraordinary when you consider he has already scored nine goals this season in just 14 games – surpassing the eight he scored in 40 games at the NCAA level with Boston University last season. The scouting report on Tkachuk was that he was going to bring a nice mixture of sandpaper and skill, but his offensive flair has surpassed even Pierre Dorion’s wildest expectations in the first two months of the campaign. The contrasting styles of the players also add an interesting layer to this debate for the Calder Trophy. Whereas many of Pettersson’s spectacular goals have ended up being replayed on SportsCentre multiple times, Tkachuk’s markers have a more distinct blue- collar feel to them. His two goals on Tuesday in Philadelphia were the perfect illustration of his handiwork this season. The first was a rebound that he deposited past Anthony Stolarz and the second was a deflection that he tipped past the Flyers netminder. Tkachuk has a penchant for skating into the blue paint and having a nose for the net. Pettersson has world-class speed and a terrific release on his shot that puts him in the upper echelon of skill in this league. Pettersson and Tkachuk play the game with completely different styles, yet they are both enjoying success in their rookie campaigns. Too often, NHL award debates turn into smear campaigns where one fan base denigrates the skill set of a rival player. Here’s hoping the passionate fans in these two hockey-centric markets appreciate the unique attributes each player brings to the table and let the chips fall where they may at the end of the season. But you’ll have to forgive Senators fans if they are a little sensitive to the Calder Trophy being handed out to Pettersson before the calendar flips to December. Ottawa fans sat through multiple seasons where Erik Karlsson didn’t win the Norris Trophy because there was a sense it “belonged” to somebody else before the season was halfway completed. As the month of November draws to a close, it’s probably safe to say that Pettersson would still win the Calder Trophy if it was awarded today. But as Tkachuk just proved, a lot can change over the course of a month. It will be fascinating to watch where these two budding superstars are in the middle of April.